Luxury Shoe Club, a startup that allows women to trade their designer footwear with others across the U.S., has officially launched with a membership club, app and sleek e-commerce experience. The goal of LSC is to make the process of consigning and exchanging high-end shoes as easy as possible for women. 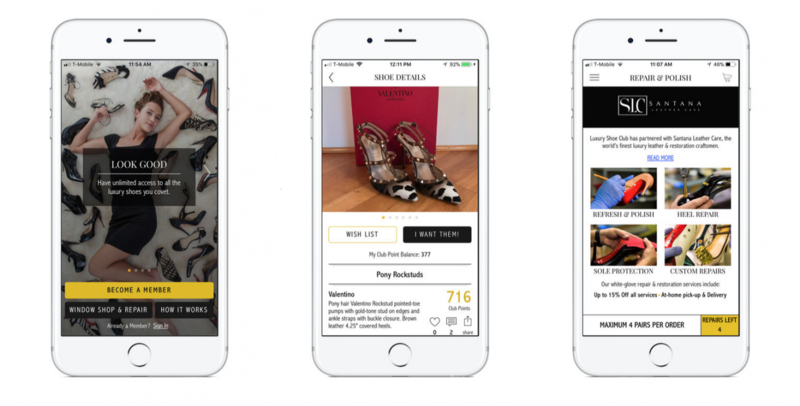 The LSC consumer was always top of mind when it came to creating the app, says Scott Van Valkenburgh, Co-Founder: “We designed the app to make it so shoe lovers can do three things: shop, sell and connect with members,” he explains. “The complexity and the investment we put into the design shows in the simplicity of users not having to think about how to use the app.” While the app is currently only available on iOS, he adds that the company hopes to deploy to Android later this year. While there are several existing online consignment services for women, many are expensive and difficult to use on a regular basis. In addition, most aren’t dedicated specifically to shoes. Another major point of differentiation for LSC is their Club Points system, which was inspired by airline and hotel loyalty points and works in a similar fashion. Van Valkenburgh describes the Club Points system as LSC’s “secret sauce,” explaining that one club point equals one dollar. “Members get paid half of the resale value upfront just for listing. They can use those points immediately to shop other’s shoe closets,” he adds. “The more shoes you list, the more points you get upfront for shopping, which means members can get shoes practically for free.” This system operates differently from that of many competitors, who take a cut of the sale price—often at least 40%—and don’t provide members with the proceeds until after the item has sold. An incredibly lucrative and popular market, women’s luxury shoes are said to make up more than $8.6 billion in sales annually. LSC’s selection runs the gamut from new-in-box to pre-owned, all with a focus on popular name-brand designers. Staying true to its slogan, Look good, feel good, do good, the service also has a robust charity program that provides assistance to disadvantaged women through a portion of membership profits. Currently, prospective members can select from three levels, each corresponding to a different amount of shoe love: Intrigued ($49/year), Passionate ($99/year) or Obsessed ($149/year). The club also offers a seven-day return policy, express shipping options, at-home pickup and cobbler repair and polish.